Nicole and Kateri waiting for their turn on stage. Hi everyone! Today I would like to share a song with you. This song was written by the Draper Museum Raptor Experience’s very own Intern Nicole and Assistant Brandon (not to be confused with Intern Nicole and her assistant, Brandon.) 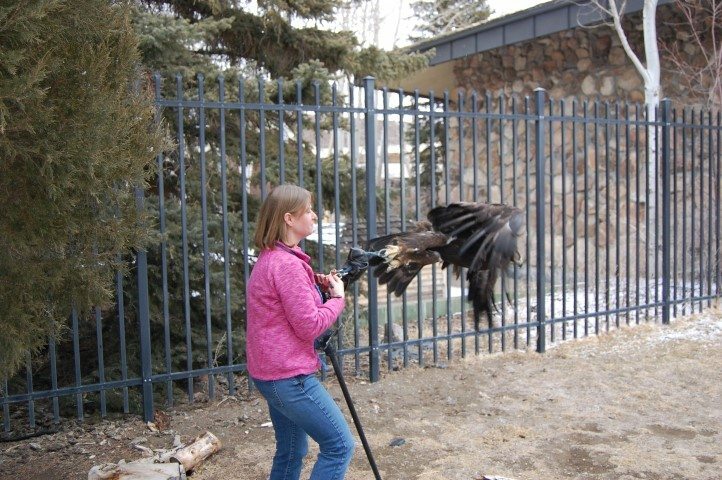 It was composed in 2014 during our summer program season, a time known to us raptor handlers as “The Great Exhaustion.” During this period of time, staff are either running around like crazy working with birds, other staff, volunteers, and the public, or lying on the floor gasping for breath in between programs. 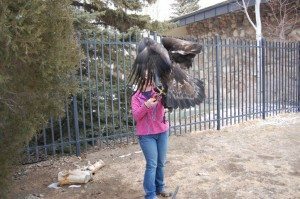 Nicole and Brandon decided to occupy their down time writing the story of The Eagle Handler, a sorrowful tale of all the woes that may befall someone who is working with an eagle on their glove. Kateri and Brandon at the end of a bate. 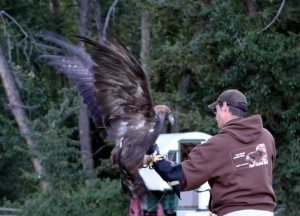 Part of the training involved in working with birds of prey, and any animal, for that matter, is to realize that accidents may happen. We are very fortunate that all of the birds living at the Center of the West are wonderful birds to work with and are not aggressive. They are treated with respect and given their space at all times. 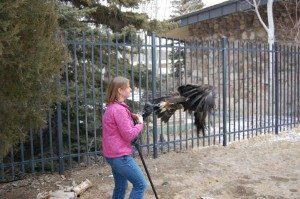 However, in certain situations, Mobile Perches (as our handlers are called) cannot leave in the middle of a program to return the bird to its enclosure when acting up. If a raptor decides that the current surroundings are not necessarily desirable, they may decide to attempt to fly somewhere else that is more preferable. (This is called a bate: the action of a bird attempting to fly from a perch or the fist while attached by a leash. The bird may be startled and wanting to leave, may have seen something attractive and curious to fly to, or may be impatient to be flying or hunting.) Unfortunately, their job as avian ambassadors prevents this. 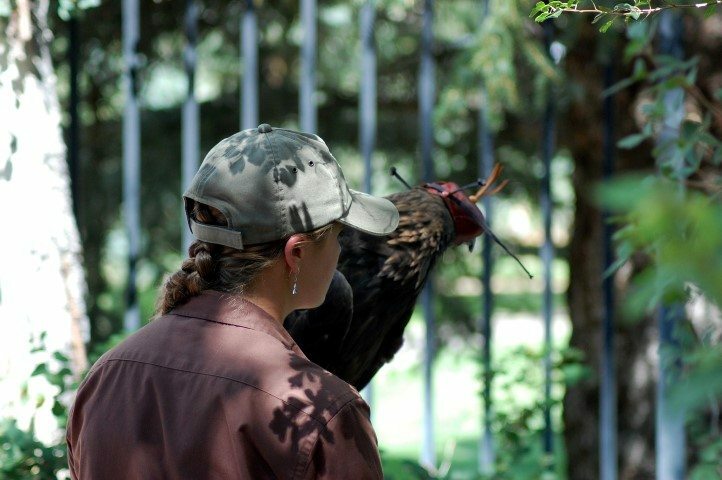 For the safety of the public, the Mobile Perch, and the bird, raptors are secured to the handler’s glove by tying the bird’s leash to a D-ring riveted to the leather. When the bird attempts to leave the glove, all the Mobile Perch can do is to continue to hold out his or her arm to provide a place for the bird to return to. 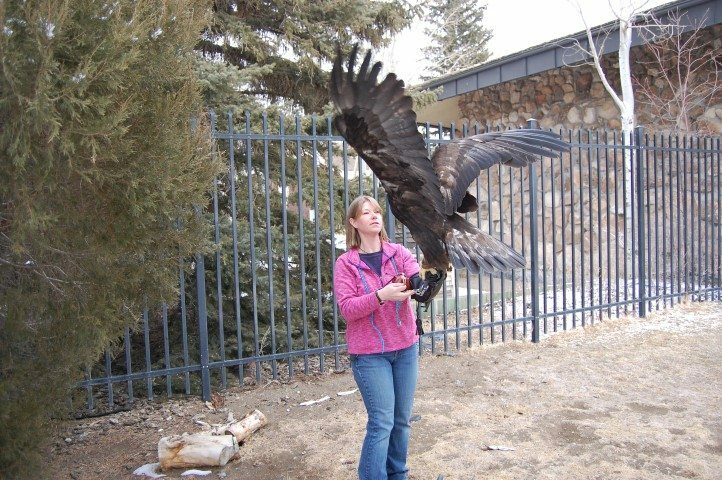 Such a feat is trivial when working with the smaller species of hawks and falcons, but when working with Kateri, a fully-grown golden eagle, the task is not as simple. During the summer programs, Kateri has a weight of twelve and a half pounds. A cane is required whenever holding her for anything longer than thirty seconds! Should she decide to attempt to fly off, the handler must struggle to keep the eagle from hitting the ground while at the same time fighting the combination of gravity, the eagle’s own weight, and the weakness of arm muscles that are not normally used. The majority of the time, DMRE raptors can get enough lift from flapping their wings to return to the glove. However, whenever Kateri bates, her weight and forceful wingbeats can create what appears to be a whirlwind of feathers, talons, and wide-eyed handler pirouetting on the stage to spectators. Fear not! Every Mobile Perch has sufficient training to safely handle the situation. Melissa holding Kateri as she begins to bate. Kateri returning to the glove. Kateri regaining her balance after a bate. I write this note to tell why your Mobile Perch is not at work today. And I had to readjust the placement of where the bird did stand. Which made the feather pass ‘neath my nose, and caused your Mobile Perch to sneeze. Then switched directions, turned about, and clocked me on the chin. And the eagle returned to my glove, and gripped it with her claw. And then and there my uniform was covered in her poop. To my dismay we found I still had ten more minutes to go. That I hope you’ll understand why your Mobile Perch is not at work today.